Spatial relationships and analysis are important when packing a travel bike (at least to me they are). Where Pam spent about a 1/2 hour packing her bike, I spent about 2.5 hours making sure everything lined up, the space was used to its potential, and the package would arrive safe and intact. Both bikes did arrived safely and with no damage. However my packed items shifted all over the place and Pam’s was in pristine condition. I’m now deconstructing what possibly went wrong with my pack and she’ll just pack like whatever next time. I explained to Pam that it was a guy thing to do the perfect pack and I had to get it right. Scratches are part of it. I think of them now as a patina. I think my pack went wrong because I put too much stuff in there. I was trying to get it right to 50 pounds with my clothes, shoes, and schwag we got from the event we attended. The netting serves no purpose other than to thwart the TSA from poking around in the case. The thinking is that they’ll just glance at it, if at all, and move on to the next piece of luggage. It seems to have worked. The 12” edge-pull case is well made, tough, and durable. For short trips across an airport, it’s ok, but the weight at that angle on your skinny-cyclists arms can get very tedious for a longer haul across terminals. I’d like to have a 4-caster option with a pull tether so I could pull it around an airport on the casters instead of dragging it behind me or pushing it. 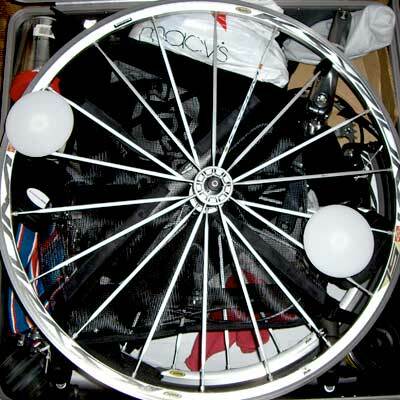 The Dahon Airporter case has the same problem with 2 rollerblade wheels. One caution: the caster fits right into the gap between the elevator car and the floor at Seatac. I pulled the case towards me sideways out of the elevator, the caster was trapped in that space, and nearly ripped right out of the case. I caught it in time and it now has a nice travel bend to it. I decided a slightly bent caster was like a nice scratch. It all adds to the travel patina noted above.